Every year the Anchorage Opera brings up amazing performers and is a key piece of The Arts culture in Anchorage. Their season posters reflect a uniquely Alaskan twist on operas from all over the world. Initial feedback on the designs was incredibly positive. The client was thrilled with the outcome, and Anchorage Opera received a lot of positive feedback on social media platforms about the design. 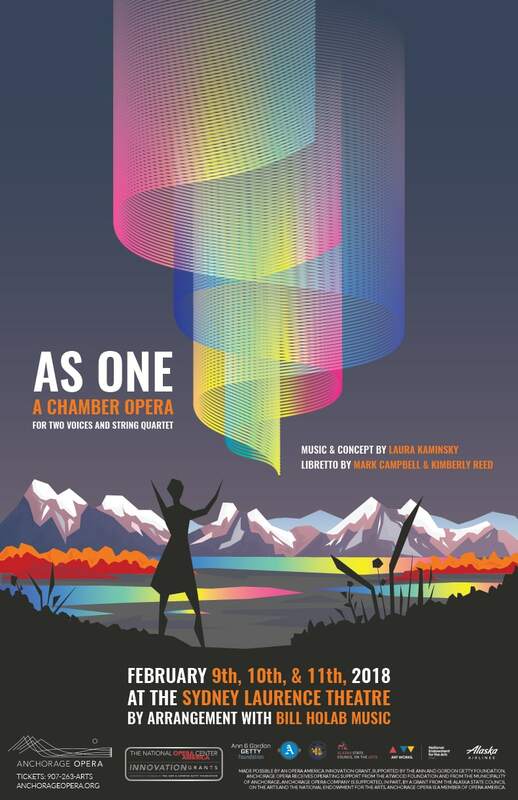 Showcasing Anchorage Opera’s productions with this caliber of original artwork highlights on a national level just how much Anchorage values the arts. Additionally, the As One opera was only possible because of a national grant. The opera’s composer was impressed with Anchorage Opera’s unique visual interpretation of the opera. Having quality posters to promote the opera helps Anchorage Opera by putting them in an even better position for future grants.